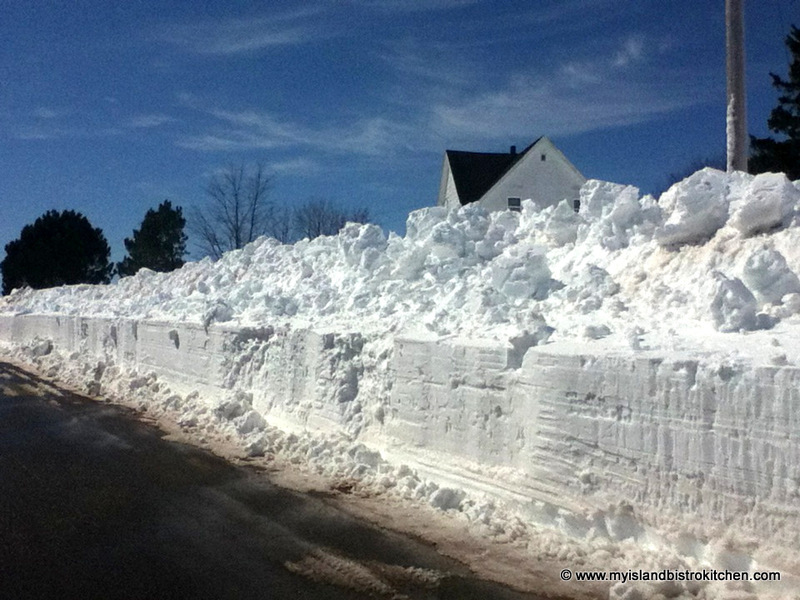 Winter 2015 has been a true old-fashioned winter for PEI. Blizzard after blizzard has left the Island buried under mountains of snow. In fact, more than 500cm has fallen – that’s over 16 feet of snow this winter! As I write this posting in early April, most of the snow, unfortunately, is still around (and more keeps accumulating) so it’s going to be a long time before PEI sees any plants growing outside in the rich red soil for which our Island is known. 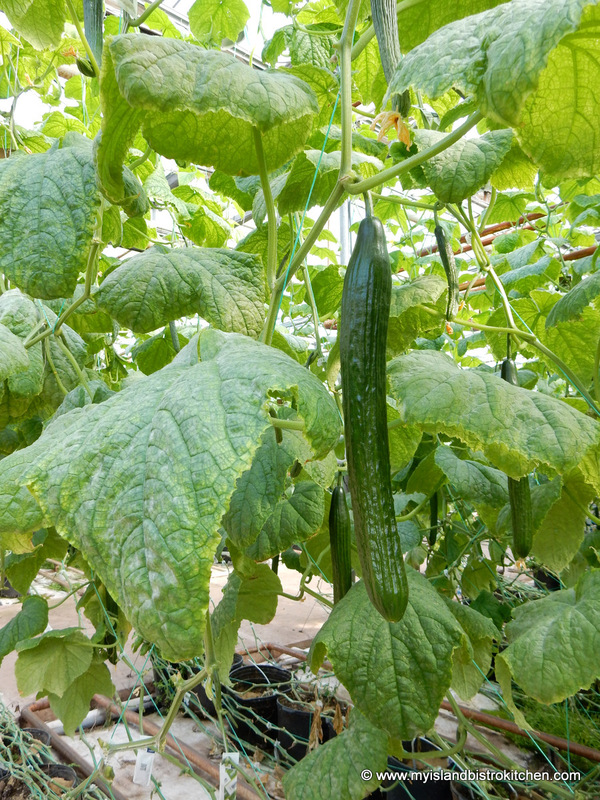 However, that doesn’t mean there aren’t vegetables growing on PEI – even in the dead of winter. Between tunnels of snow banks (some of which were more than twice the height of my car) and sometimes through side roads barely one lane wide in places, I made my way to Spring Valley to visit the Schurmans who operate a large greenhouse where they grow organic vegetables for sale year-round. 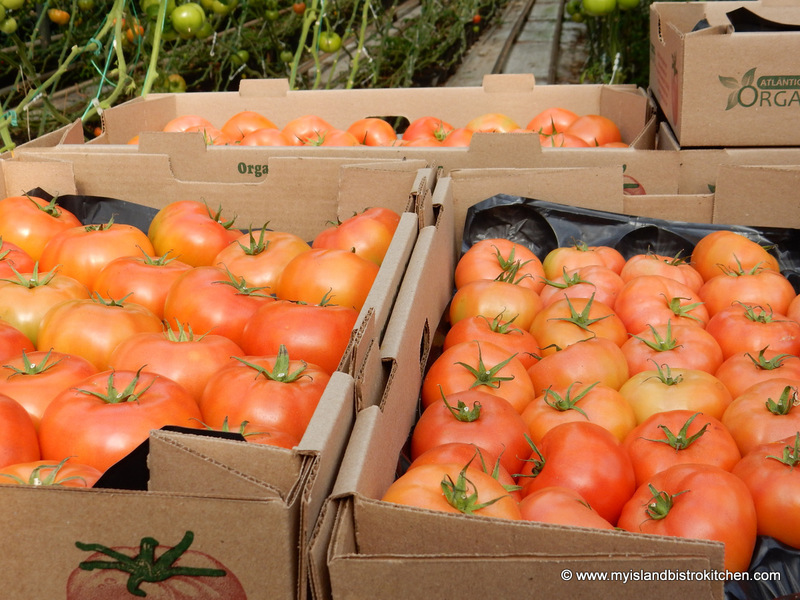 In fact, if you live in Atlantic Canada and shop at Sobeys and/or the Atlantic Superstore, you have access to their Atlantic Grown Organics brand organically-grown tomatoes and cucumbers because both stores carry produce from the Schurman greenhouse. So, this year, while I’m not going south, I did spend an afternoon with Krista and Marc Schurman in their greenhouse which almost seemed tropical! Spring Valley is a rural community that is located just outside the town of Kensington on the Island’s north side. The Schurmans, former livestock producers, built the greenhouse in 2001 when they made the decision to diversify their farming operation from livestock to vegetable growing. 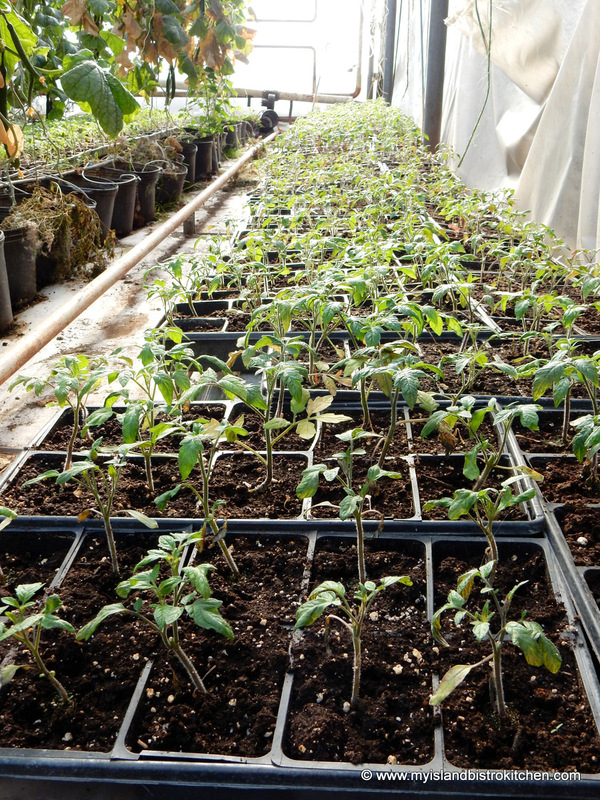 The Schurman greenhouse is home to close to one (1) acre of produce grown year round. Marc, a third generation farmer, has a degree in plant science from the Nova Scotia Agricultural College (NSAC) in Truro, Nova Scotia. From the time he was a wee lad, he has had a keen interest in growing vegetables so his career choice was a logical one. His wife, Krista, has a degree in animal science, also from NSAC. Farming is clearly in the blood of the Schurman couple and it is evident from chatting with them that farming is their passion and they are committed to producing quality food for market. 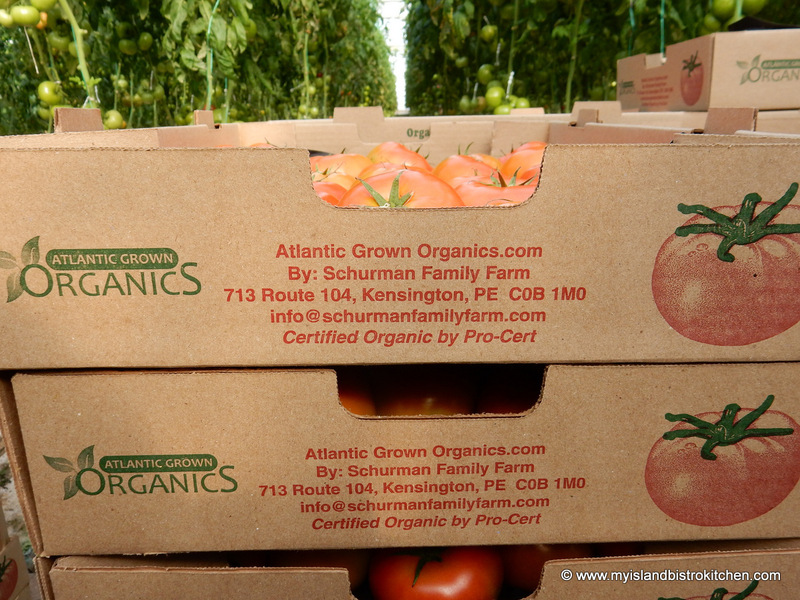 In 2006, the Schurmans, who market their produce under the label “Atlantic Grown Organics”, became a 100% organic greenhouse operation. Farming organically is not without its challenges since it operates differently than conventional farming. One of the biggest challenges is to create a mini-ecosystem versus using chemicals to control for insect pests and plant disease. 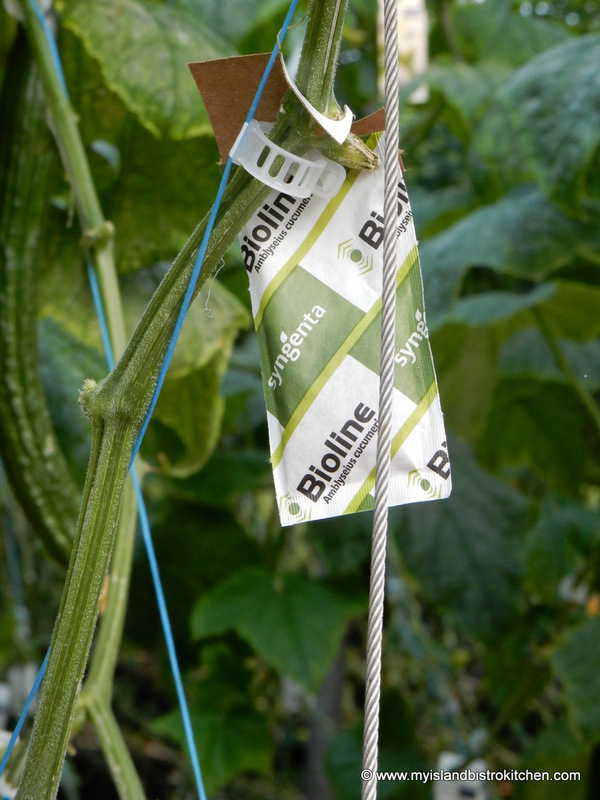 Insect packets (like those in the photograph below) are hung on the vines of the plants throughout the greenhouse. These packets release beneficial insects that, essentially, eat the bad insects that can destroy plant leaves and vegetables. 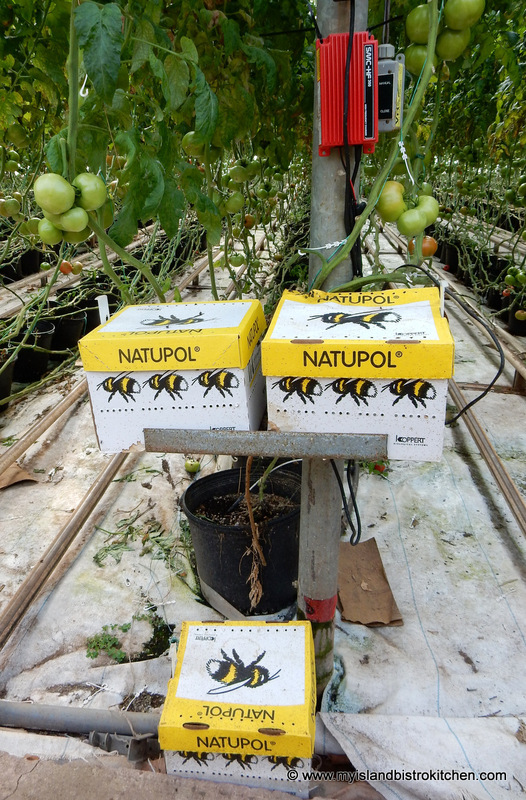 To simulate a natural environment, every six weeks, new hives of bumblebees are introduced into the greenhouse. The bees buzz around, doing their job to pollinate the tomatoes. New hives are brought into the greenhouse every six weeks so that, as the hives age, there will always be young productive bees available to carry the load of pollinating thousands of flowers every week. 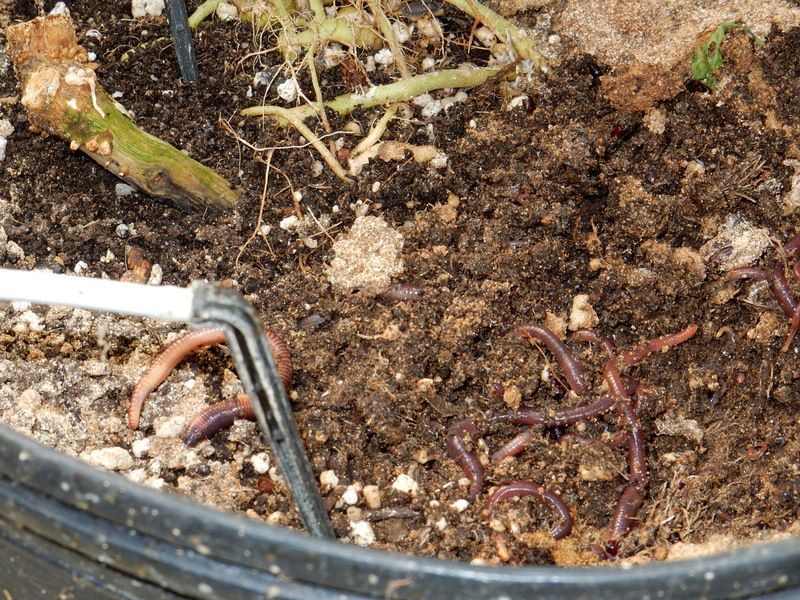 Earthworms are used in the plant pots to keep the soil loose – essentially, they work and till the soil. 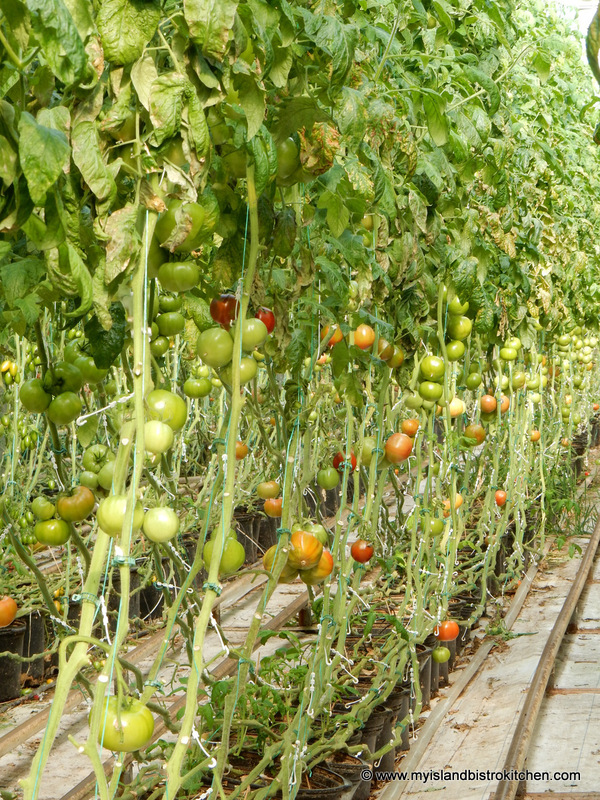 While greenhouse farming means more control can, in some respects, be exerted over growing conditions, there is a challenge to constantly balance the humidity and ventilation in the greenhouse as too much humidity can breed plant disease. 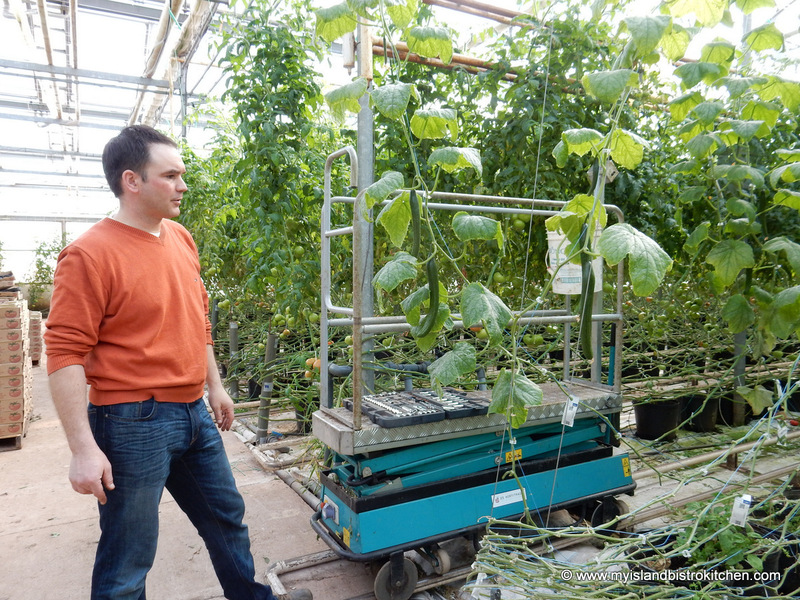 The greenhouse relies on a computer system to indicate when there is too much humidity, at which time it tells the greenhouse roof to open slightly to let in some ventilation. When the humidity is once again balanced, the computer tells the roof to close. 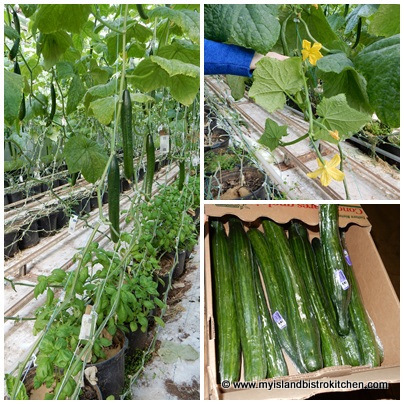 Large pipes filled with hot water circulate throughout the entire greenhouse keeping the plants toasty warm and providing optimal temperature for plant growth. A wood waste burner heats the water and a back-up generator provides assurance of a heat source should there be a loss of electricity. It wouldn’t take many hours without electricity in a PEI winter storm, for example, for the farm’s entire crop of producing plants and tiny seed plantings to be destroyed. 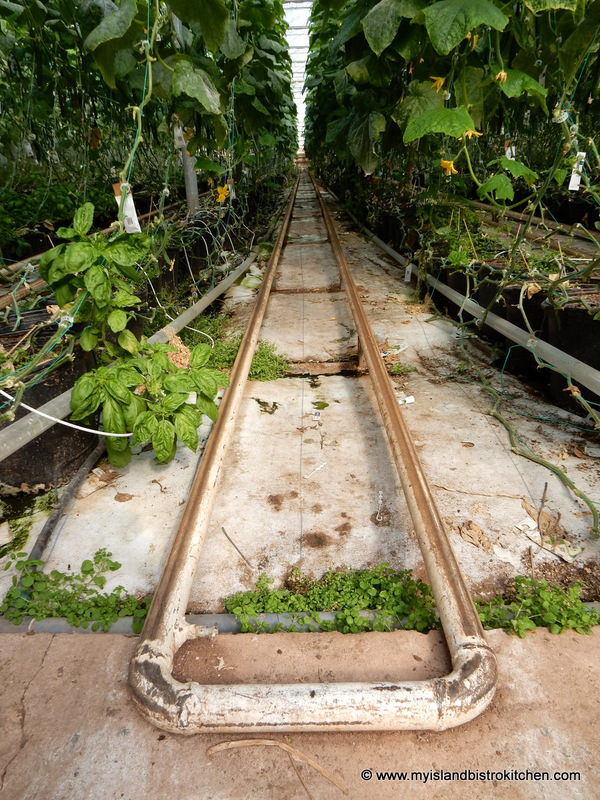 The series of hot water pipes also function as a sort of railway track for a cart and workers to move between the rows of plant pots so the plants can be pruned and harvested. 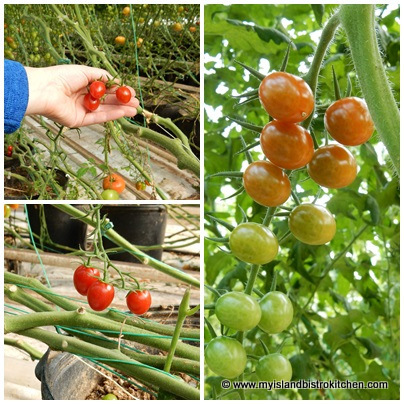 The farm functions with a staff of three full-time employees and the couple’s three children help with picking the tomatoes from the vines. 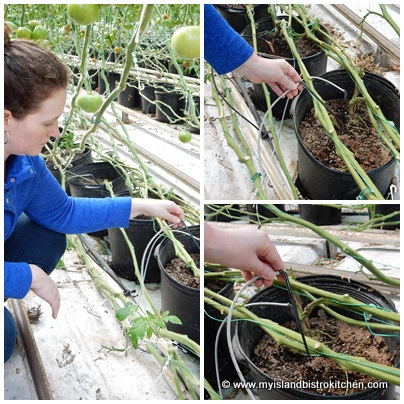 Each plant pot is individually hooked up to the water sprinkling system that is triggered by readings from a weather station on the greenhouse roof as watering is measured by the amount of natural sunlight. 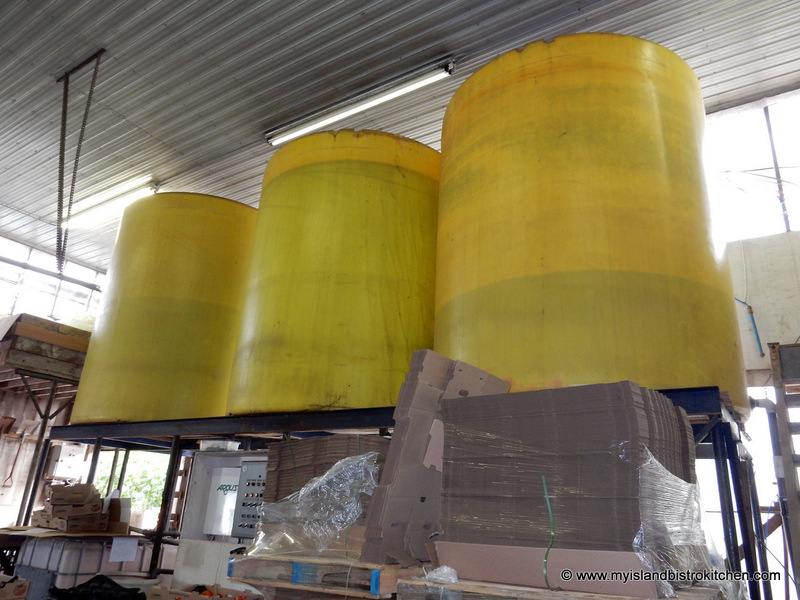 These water tanks are not your ordinary watering cans! 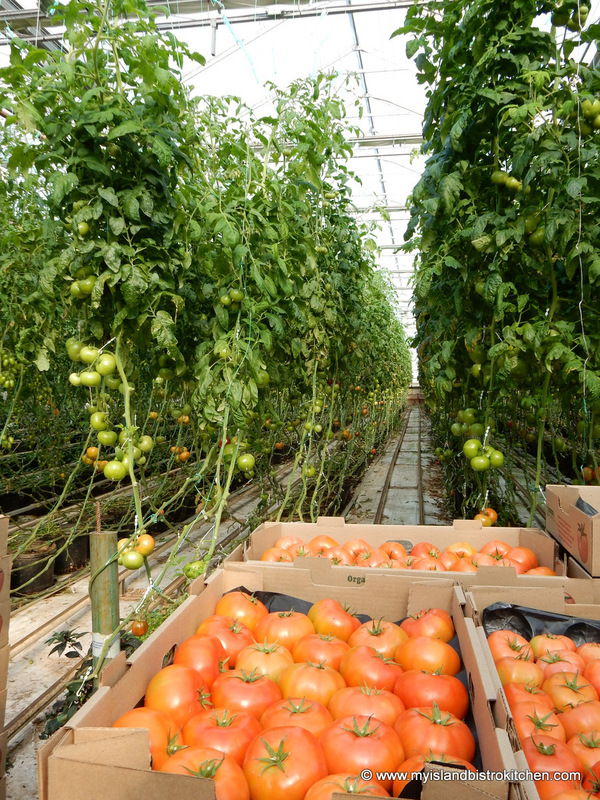 The main business of the greenhouse operation is to produce organic tomatoes and cucumbers for wholesale to Sobeys and the Atlantic Superstore in Atlantic Canada. However, the Schurmans also direct market their produce at both the Charlottetown and Summerside Farmers Markets. Here (in addition to the tomatoes and cucumbers), you may also find special treats like fresh greenhouse-grown strawberries in winter along with lettuce, kale, herbs, peppers, beets, green onions, and even eggplant, grown especially for their Farmers Market clientele. 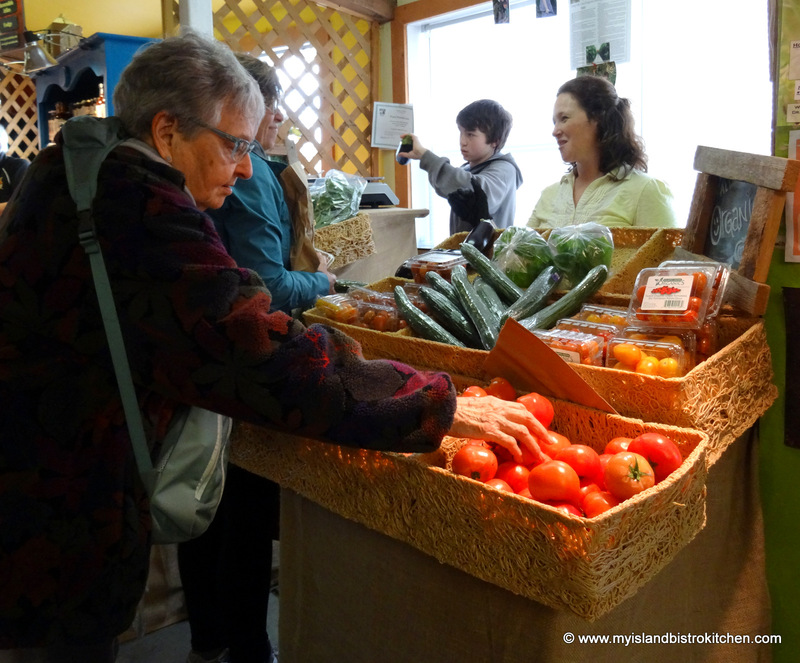 From early spring to late fall, the Schurmans also have a vegetable stand at the farm gate on Route 104 in Spring Valley. 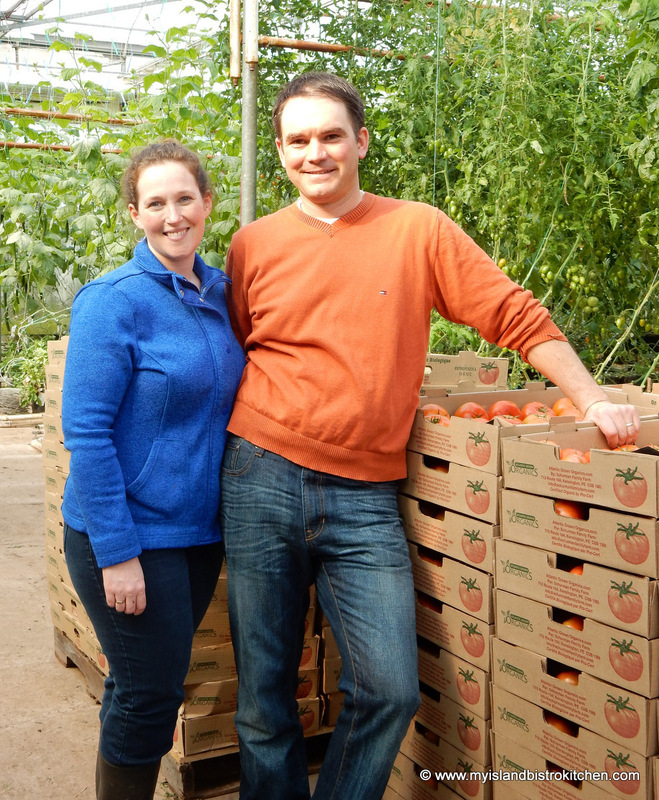 The Schurmans find great satisfaction from their greenhouse operation. 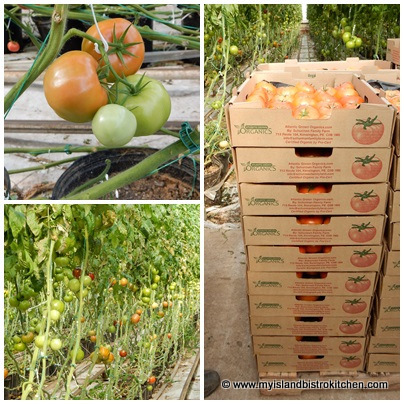 They say that producing big boxes of fresh, organically-grown, red tomatoes in the dead of winter on PEI, when there is little if any vegetation growing elsewhere, is deeply satisfying. They also find it gratifying to connect with regular customers each Saturday at the local Farmers Markets as this opportunity provides them with feedback on their produce and appreciation from customers seeking good quality organic produce that is locally produced year round. I believe it is always good when consumers can meet and connect with those who work hard to locally produce our food. So, if you are lucky enough to live in PEI, you can meet the Schurmans, face-to-face, on Saturdays at the Farmers Markets. 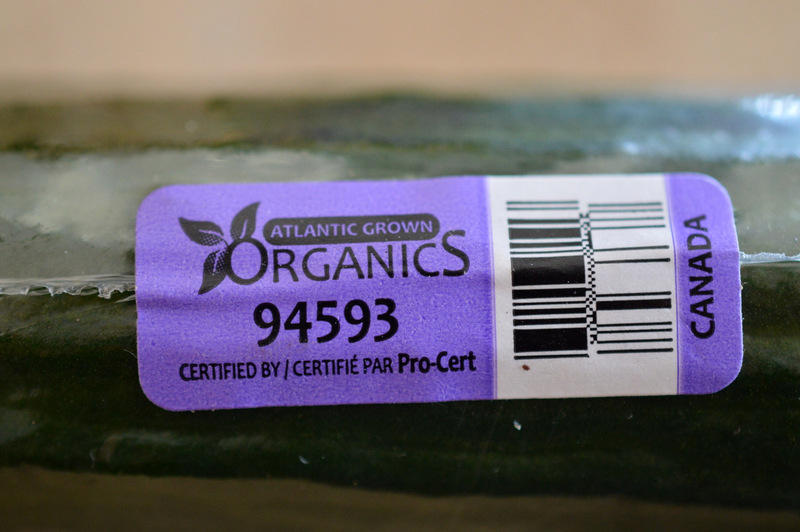 Otherwise, be sure to look for the purple label “Atlantic Grown Organics” on the organic tomatoes and cucumbers when shopping at Sobeys and/or the Atlantic Superstores in Atlantic Canada. Buying these Island products not only supports local farmers and helps them to be sustainable operations but you’ll know you are buying quality, safe, fresh organic produce. I think, if I had been working inside this greenhouse this year, I would hardly have noticed it was even winter (well, maybe not until I stepped outdoors)! For more information on the Schurman Family Farm, visit their website. 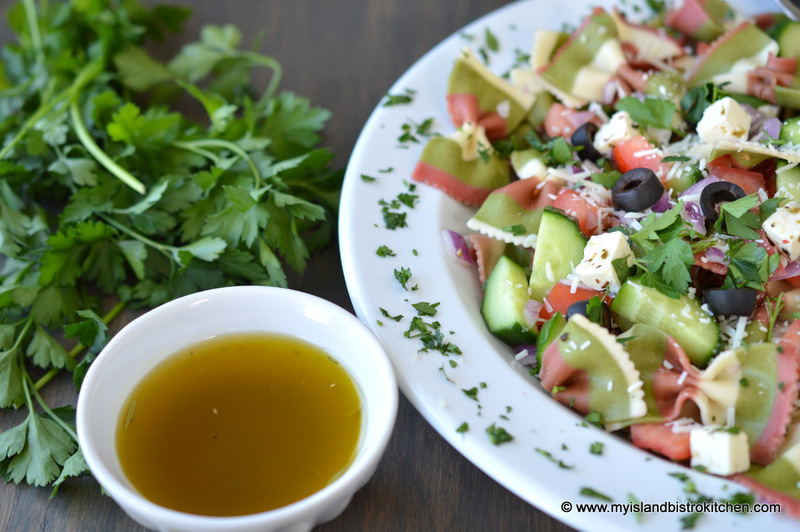 The recipe in which I have chosen to feature tomatoes and cucumbers from the Schurman Family Farm is a colorful pasta salad with herb dressing. 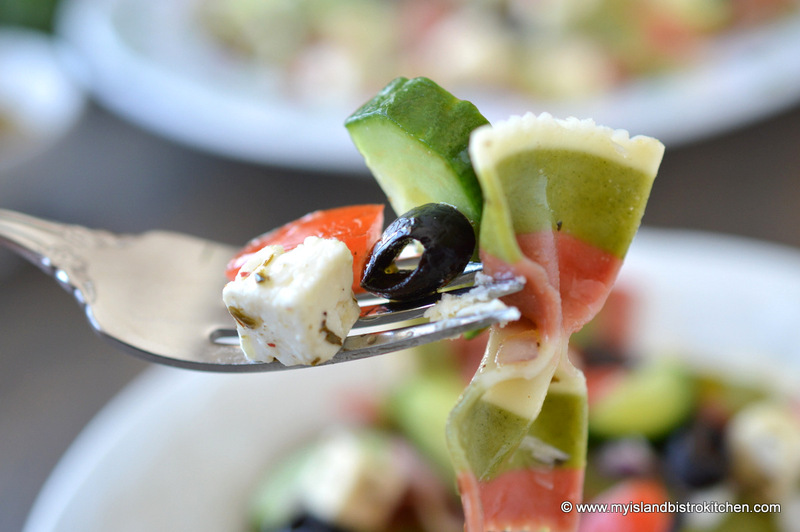 While it is always important to use quality fresh ingredients in any recipe, it is doubly important when making salads because this is where the raw veggies star and you really taste their flavour. I couldn’t have gotten vegetables any more fresh than these that were just picked off the vines in the greenhouse. 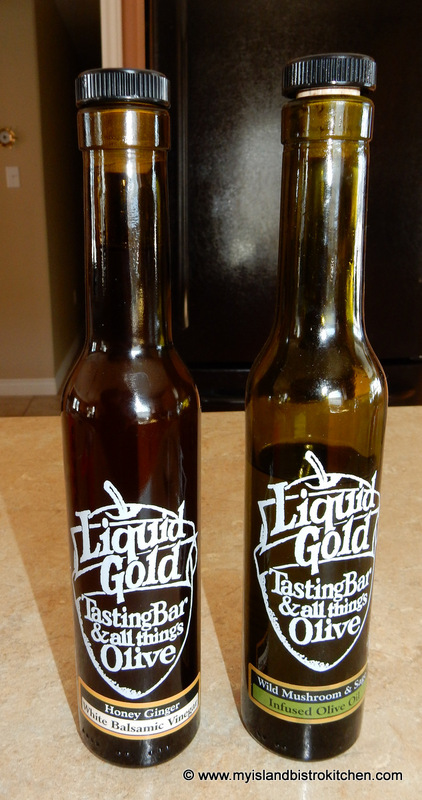 The quality and flavour of olive oil and balsamic vinegar is also important in the salad dressing. For this reason, I have used products from the Liquid Gold and All Things Olive store here in Charlottetown, PEI. 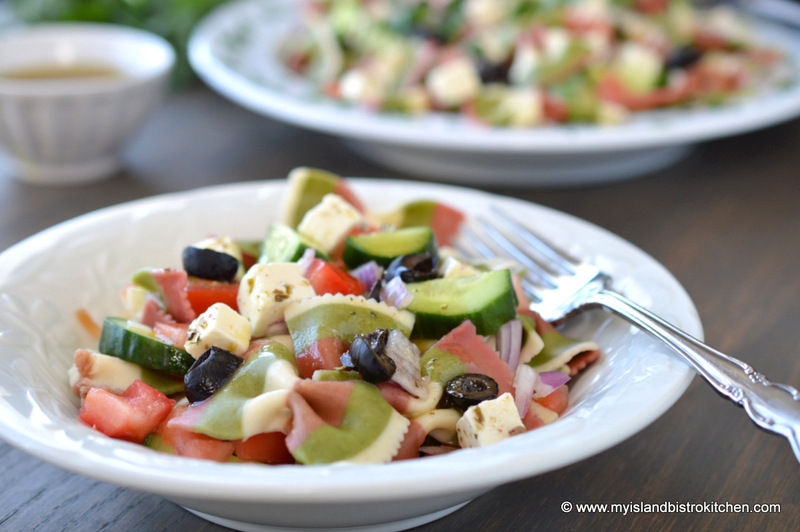 You can use any olive oil and balsamic vinegar – either flavored or plain – that you wish; however, it will obviously change the flavour of the dressing. For this recipe, I chose to use the Wild Mushroom and Sage Olive Oil which I paired with a Honey Ginger Balsamic Vinegar. 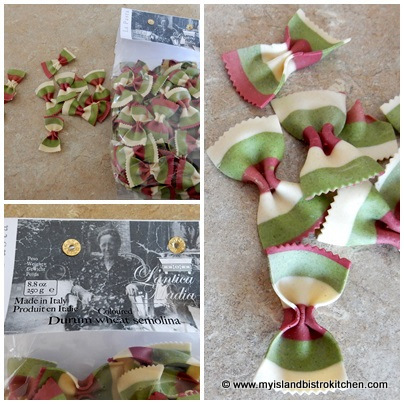 You can use any kind of bow tie pasta for this recipe. 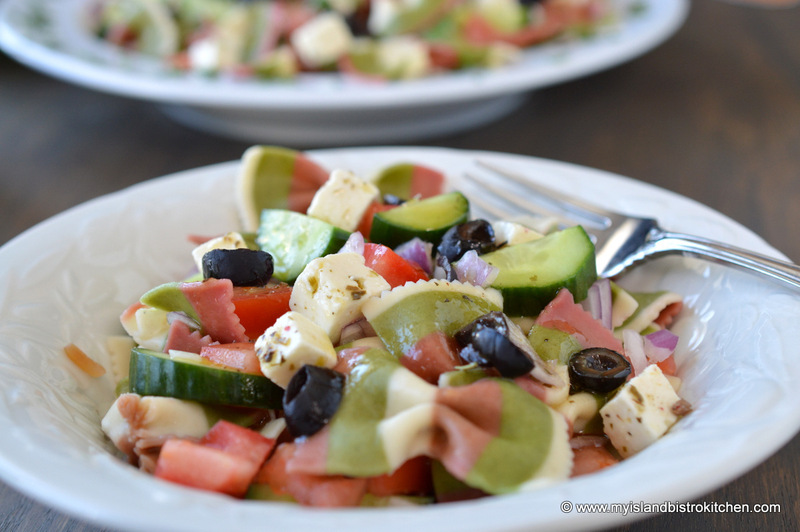 I’ve chosen to use colored Durum wheat semolina from Italy because I love the tri-colored pasta which makes a colorful salad! Cook pasta, for length of time and in amount of boiling water and salt indicated on package, adding the oil and onion soup mix to the cooking process. Drain pasta, rinse in cold water, and allow to cool completely. Cut ends off small cucumber and slice in half, horizontally. 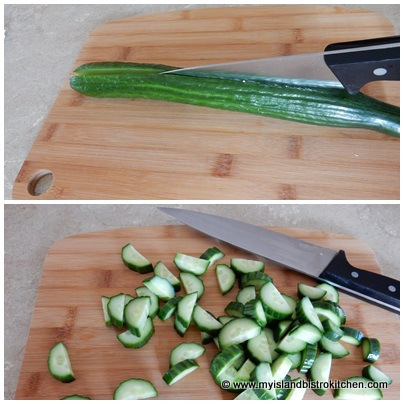 Cut cucumber into ¼ inch pieces. 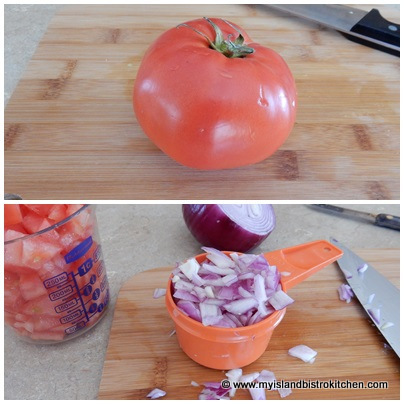 Coarsely chop the tomatoes and red onion. 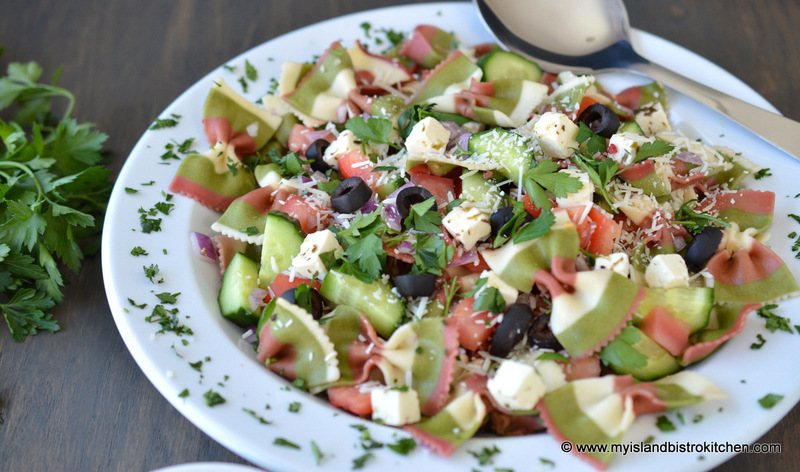 Place pasta into large bowl and add the cucumber, tomatoes, and onion. Toss to mix, being careful not to tear pasta. Drizzle with just enough dressing to coat all ingredients. Cover and refrigerate for 1-2 hours to allow flavours to mix. 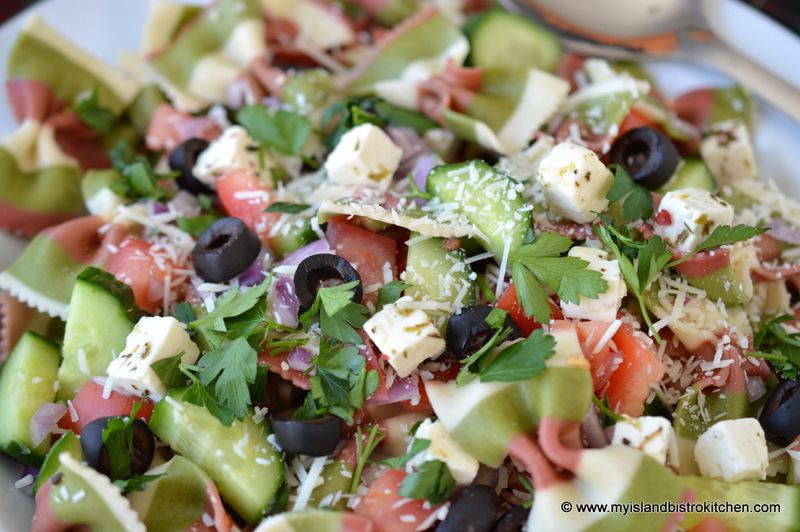 At time of serving, mix in olives and add more dressing if needed/desired. Transfer to serving bowl. Sprinkle with cheeses and fresh parsley. Mix all ingredients in glass jar. Cover jar tightly with lid and shake jar vigorously to fully mix and incorporate all ingredients. Refrigerate until use. 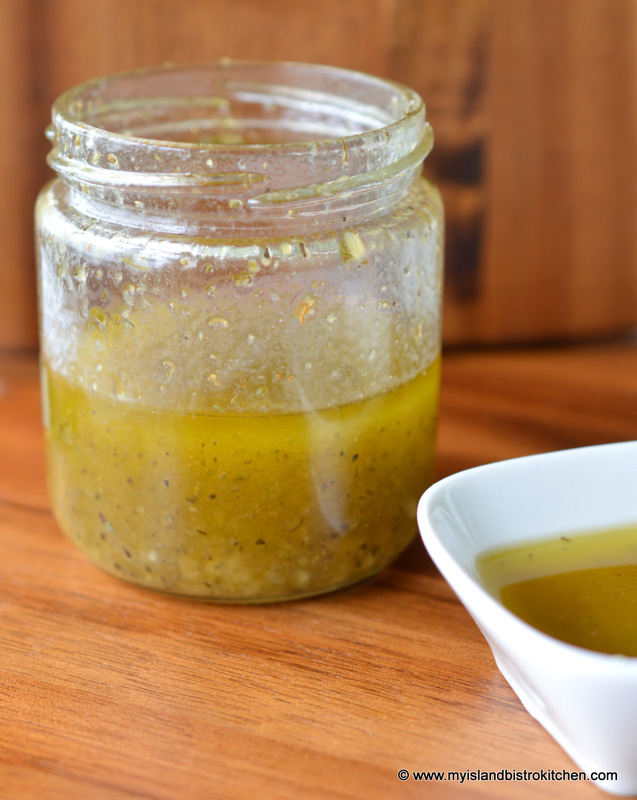 Remove from refrigerator to allow dressing to come to room temperature (5-7 minutes). Shake jar to mix dressing, then drizzle over salad.